Before you buy that Season Pass, do the math. How many days is your family really going to hit the slopes? You better be sure little Johnny doesn’t sign up to play basketball every weekend or join the swim team this winter? Out west there is the Vail Resort Epic Pass, which offers savings on a dozen West and Colorado ski resorts for about $899 early purchase, plus skiing at Okemo and Stowe Vermont, California’s Northstar, Heavenly and Kirkwood, Park City Utah, Whistler Blackcomb and the bonus of skiing at Val Thorens France, and Verbier Switzerland. We had a epic ski season, with over 40 days on the Epic Pass in Colorado, Utah, Canada and France… amortizing just $22 a day! To truly max out your winter skiing, consider the IKON Pass, starting at $599 each, valid for 5 days each at Killington, Stratton, Sunday River, Loon, Sugarloaf, Sugarbush, and out west for skiing at Big Sky Montana, jackson Hole Wyoming, Mt Bachelor in Oregon, Aspen’s 4 resorts, Steamboat, Winter Park and Copper in Colorado, Deer Valley, Snowbird and Alta in Utah, Squaw, Alpine and Mammoth in California, plus Tremblant, Revelstoke, Banff, Lake Louise and Norquay in Canada. This was formerly the Max Pass it now gets you 5 days at each at so many resorts! Parents need to be realistic and even regimented about their family’s ski schedule when making that size investment. Ski resorts start selling their next season’s pass in the spring – often when the ski lifts are still spinning. You can even get free skiing for the remainder of the season by buying next year’s ski pass in March or April at an early purchase discount. The key is that you commit to enough skiing to justify the cash. If you just plan to ski in the North East, buying The New England Pass in the spring gets you the best rate, good at Sunday River, Sugarloaf, Loon. The White Mountain Super Pass is a good New Hampshire skiing deal for Bretton Woods, Cannon, Cranmore and Waterville Valley. On the flip side, lift tickets for the family can quickly exceed two Benjamin’s a day, so if your winter calendar allows for several weekends and a few holidays, a multi-mountain pass could be just the ticket and the sooner you buy – the better the deal. 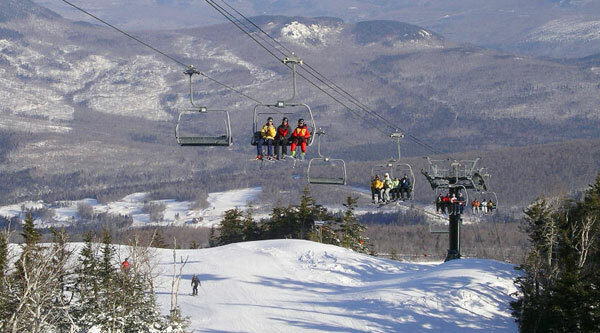 Pats Peak, Ragged, Black and Cranmore all have reasonable season pass rates, while they don’t have a family pass, the cost of two adults and two kids tallies up to about $1,500. NH residents catch a break at State-owned Cannon, two adults and two juniors adds up to $1,550 for the season. Bromley in Vermont gives a discount for each additional family member pass – adult, child or teen, after the first family member purchase at full price, so a discount of up to $100 per pass is applied when you are buying for your family. Sugarbush offers a Family Pass deal, a free youth pass (for dependents 12 and under) with every Adult Sugarbush pass, so a family of four could ski or ride Sugarbush for under $1,500. Bolton Valley in Vermont sells passes for a family of four pass for under $1,600, along with some interesting new pass categories like Ski and Play Days that include daycare during your skiing. Bolton’s Powder Pass gets you 5 lift tickets for the price of three. The “shared parent pass” category has emerged in recent years. While you have infants and toddlers not quite ready to hit the slopes, this pass makes sense, or saves cents for parents. Dad bags runs while mom gets base lodge duty with the baby (legally, versus swapping a ticket). But long term, this tag team pass doesn’t promote “family skiing” in the true sense – mom, dad and the little ones all skiing together like the ski resort brochure promotes. Stratton offers a Parent Pass, when you purchase a children’s season pass, you can buy one parent pass for $1,399 to share with your spouse. In Massachusetts, Wachussett does not offer a family pass per se, but you do receive a ski shop credit of $20 for each family member Gold Pass you purchase. Check out the frequent skier cards that provide substantial savings off lift tickets once you have bought the discount card in advance if a pass is more than you can pony up (available at Killington, Smugglers, Sunday River, Sugarloaf and Loan). Okemo has 3&Easy Pass for 3 day skiing, unrestricted and transferable, your family can even use them all together on the same day. Once the big investment is made, think of your family pass as “winter glue,” as you stick to a plan to ski more, and amortize the cost down with each alpine visit. With a pass, you can ski just for the morning, but you’ll ski both days of the weekend. Conversely, when you are buying ski days a la carte, you can find any number of excuses not to shell out for full price lift tickets for the family (weather, work, chores, the drive, sleeping in).